This is the follow-up to my last post featuring my Goat Cheese and Tomato Tart. As I was mentioning, I've found myself countless times with leftover scraps of puff pastry which sadly never really turn into anything. This recipe is my easy way to do something productive with these leftovers, and to waste less! I designed this recipe for 4 individual tartlets, but it's such a simple recipe that you can easily modify the quantities to fit any number of tarts. These tarts take minutes to make and are the perfect way to end any meal - or to enjoy as an afternoon treat. There is no added sugar, just some velvety bittersweet chocolate, some powdered almonds and some pear. Pear, chocolate and almond is always a winning combination in my book and I never tire of coming up with different combinations to use them together. I've often been asked what items I always have in my pantry - and bittersweet chocolate chip and powdered almonds are always great staples to have on hand. Powdered almonds are used in a variety of desserts and add that perfect touch of nuttiness to any sweet treat. Adding powdered almonds to certain tart doughs is absolutely delicious, as is adding it to tart fillings. Canned pears, on the other hand, are not an item I usually have on hand but for quick desserts like this one, it really helps to ensure that your dessert will be perfectly cooked in very little time as the pears are juicy and soft. So here goes..! Preheat your oven to 350F. Roll out your leftover puff pastry until it's about 1/8 inch thick. Using a cookie cutter, cut out 4 circles of dough, slightly bigger in size than the diameter of each muffin mold. Lightly grease 4 of your muffin molds and add one puff pastry circle into each mold, Using your fingers, gently press down on the center of each circle so that they take the shape of the mold. Melt the chocolate chips in a small double boiler. Add the cream and stir until smooth and creamy. Add the powdered almonds and stir. Divide the chocolate mold between the 4 tartlets. Add a piece of pear at the center of each, and, using your fingers, gently crinkle the dough on the sides of the muffin mold so it folds back onto the chocolate batter. Bake for 10 to 12 minutes, or until the puff pastry is golden brown. Serve warm or at room temperature. Enjoy! I could seriously pop one in each cheek!! Chocolate and pears.. sounds delicious.. I think this is an excuse to make some puff pastry dough! I'm always looking for new things to do with puff pastry ... love the sweet combo here! I usually end up making little apple tarts with my puff pastry scraps, but I like this idea so much better. 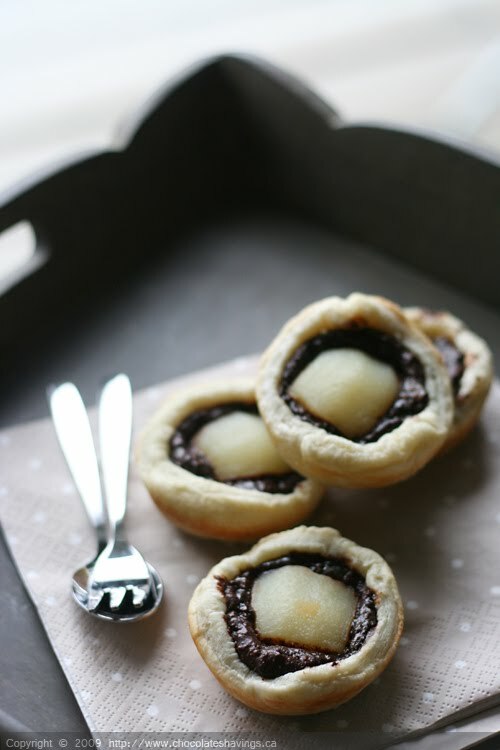 These little tarts look so elegant and sophisticated. I like this idea. I just made some puff pastry so i'll try this technique! you can find recipes of breads and brioches that will remember you the snacks of your childhood !